A few months ago, I saw an advert for a job heading up the Policy and Research teams at Missing People. 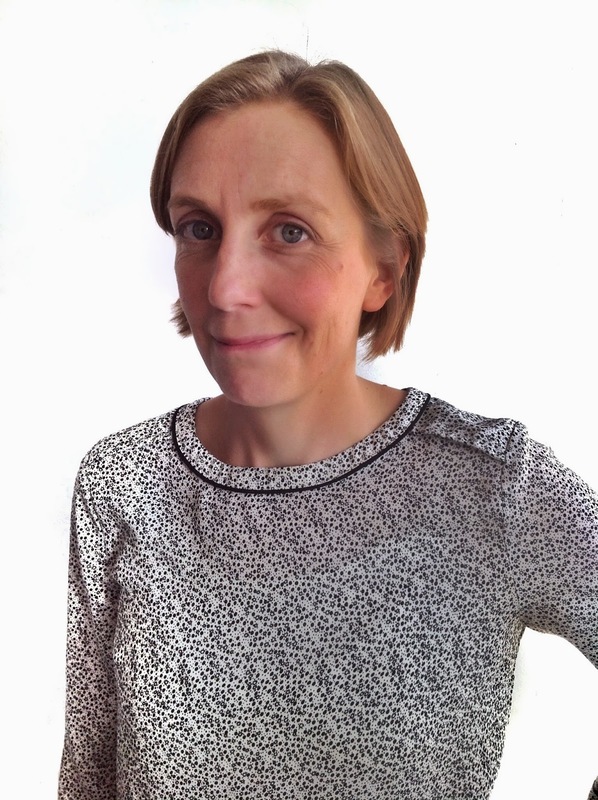 I decided to apply because it looked like a brilliant role, and because I had heard great things about the charity. However, the reality of working for Missing People is even better than I imagined. I have been endlessly impressed by the passion, expertise and commitment of staff and volunteers and by what the organisation has achieved, working with partners and supporters. When I’ve told friends about my new job, lots of them want to talk about someone they know who went missing, or a missing person they’ve read about in the papers. These stories are all very different, but the thing they have in common is the distress and anguish experienced by the missing person’s family and friends. 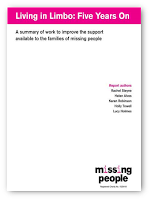 I am proud to be able to tell them about the direct support Missing People provides for families and about the Policy and Research team’s work in highlighting the challenges families face and in pressing for change where it’s needed. In 2008, Lucy Holmes wrote Living in Limbo, a groundbreaking report into the impact on families when a loved one goes missing. The report highlighted the maze of practical and financial challenges that families face on top of dealing with the unimaginable trauma of not knowing what has happened to their loved one. Living in Limbo led to the creation of our Missing Rights Campaign, which aims to ensure that families get the support they need, and are spared the unnecessary stress of dealing with financial and legal bureaucracy. Five years on, and Holly Towell, and the rest of the Missing People team have done incredible work to make the Missing Rights Campaign a reality. 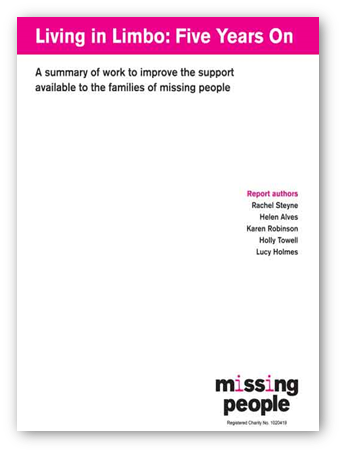 In 2011, the first cross-government strategy on missing children and adults was published, including an objective to provide families with the support and guidance they need. Last spring, the Presumption of Death Act was passed to simplify the system for families who need to resolve their relative’s affairs if they are missing and presumed to be dead. In June, the government announced that it would consult on proposals for guardianship, which will enable family members to manage their missing financial and legal relative’s affairs, similar to power of attorney. Families, partners and other supporters have played a pivotal role in all of these achievements. Family members provided powerful evidence to the government, convincing them of the need for new legislation to help overcome the immense practical and legal challenges they face. This weekend I had some rare free time. I sat in the hairdressers leafing through Marie Claire magazine, only to find an article about missing women that quoted Jo Youle. My hairdresser and I then got talking about Missing People and I explained about how we help missing children and adults as well as their families, and tried to sign him up for next year’s Miles for Missing People. That evening I went to the cinema and came across an electronic billboard showing one of our publicity posters for a local missing 13 year old. Those few hours brought home to me yet again just how wide ranging Missing People’s impact and influence is, and what a crucial role the charity plays in being a lifeline when someone disappears.